Style #T3418-P This new Cool-jams 2 Piece Moisture-Wicking Capris Set pairs a cool and comfy v-neck t-shirt with matching elastic waist capri length bottoms. For this style we use one of our beautiful embossed print wicking fabrics in the Niagara Vine color. This super quick drying, silky soft, moisture wicking smart fabric is perfect for travel or for combating night sweats. Wear our versatile women's moisture-wicking pajama set during the day or while sleeping. Every Cool-jams garment uses our smart fabric technology for a super soft, cotton-like feel with wicking ability that never washes out. In fact, the wicking action is scientifically woven into the fabric itself along with technology that inhibits the growth of odor causing bacteria keeping Cool-jams fresh and odor free. Moisture-wicking capris inseam length 21". 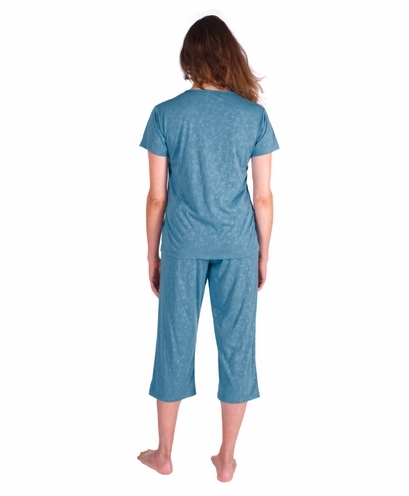 Wash your women's moisture-wicking pajama set in cool or warm water on gentle cycle. Never use fabric softener or fabric softener sheets because it will minimize the wicking properties of the fabric. If you accidentally use fabric softeners, re-wash the garment in clear water to remove softener residue, so the wicking properties will return to maximum effectiveness. Lay your garment flat or hang to dry. Tumble drying won't damage the garment, but can sometimes create static. This is the only brand I have worn for years. This brand really helps me sleep better by wicking away the moisture from my body from night sweats. They are quality made, wash well and are very comfortable to wear. Thanks Cool-jams for helping me with my gift purchase. I bought my wife these pjs for her birthday and she couldn't be happier with the gift. She really liked the subtle print and the color. She says they help her sleep better. She may become your biggest repeat customer yet. I think I've created an animal.